Youth Hostel Piran i Piran, Slovenia: Bestill nå! 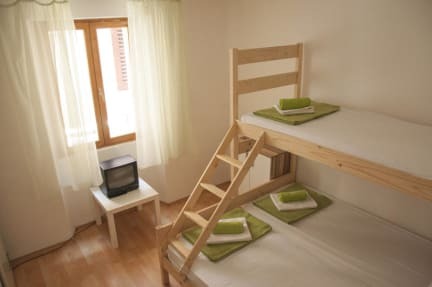 Hostel Piran is situated on a pedestrian area, right in the heart of the old part of town, only 100m from the famous Slovenian beach and 10 min walk to the Bernardin congress center. Located between boutiques, restaurants, bars and pubs it is the perfect place to stay for artists, young people, students, and those who are young at heart. 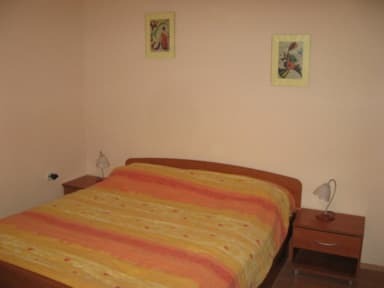 The rooms are colourfully equipped. Two bathrooms are shared between four rooms. There is also a modern washing machine available. The cheerful staff will make you feel at home in one of Piran's most exceptional hostels, and help you forget that you are a stranger in this town. We open at 9.00 a.m. and close 21.00 pm. We kindly ask you to let us know your arrival time especially if you arrive when reception is closed. You can go to the Tourist information center located in Tartini square where you can ask them to call us free of charge and we will come to pick you up.